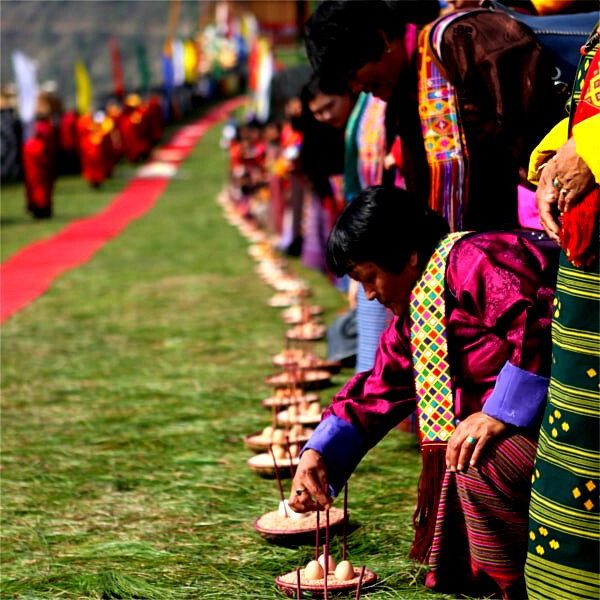 Ura Yakchoe is a religious festival conducted in the picturesque village of Ura under Bumthang district. Besides mask and folk dances, a sacred relic, a statue that came to village mysteriously is put into display during this festival. A Lama (Buddhist priest) approached an old woman outside her house and asked for a cup of water. When she came out with water, the priest has disappeared leaving behind a sack that contained a statue. 1. Memorial Chorten: Located in the heart of Thimphu city, it was built in 1974 by Her Majesty the Queen Mother Ashi Phuntsho Choden in memory of her son, Third King Jigme Dorji Wangchuck. The three-storey Chorten houses several relics such as Phurba Lhatshog, Kagay, Khrowo Nampur Gyalwa, Guru Tshengye, and Khenlop Chesum. The Chorten is today the spiritual nerve centre of the city. 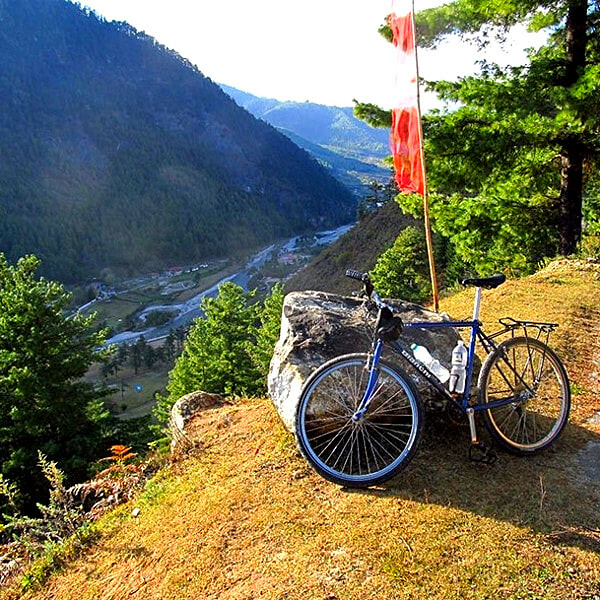 Proceed In the morning tour around Thimphu valley for a while and slowly towards Punakha via Dochula Pass. On the way we will pay visit to Khemae Lhakhag. After arriving at Punakha we will pay visit to Punakha Dzong. 1. Khemae Lhakhang: Located on a hillock in Lobesa (Punakha), the temple was built in 1499 by Lam Ngawang Chogyal, the cousin of Lam Drukpa Kunley, on the spot where the latter subdued a demon who was running away in the form of a dog. Lam Drukpa Kunley buried the demon and said there was no dog now (khe – dog; mae – no). Hence, the temple came to be known as the “temple of no dog”. Today however it is pronounced as Chimi Lhakhang. The temple contains the bow and arrows of Lam Drukpa Kunley and a phallus to bless the visitor. 2. Punakha Dzong: The dzong is situated on a stretch of a land where two rivers – Phochu and Mochu – meet. The dzong was built by Zhabdrung Ngawang Namgyal in 1937 and named it Pungthang Dewa Chenpai Phodrang, the palace of great bliss. Later it became the final retreat palace for him. The first monarch, King Ugyen Wangchuck, was crowned there and it served as the capital of the country until 1955. Today it serves as the winter residence of the Central Monastic Body. The sacred relic Rangjung Kharsapani is also kept in the Machen Temple inside the dzong. After early breakfast, we will head out for a daylong drive towards Trongsa. At Trongsa we will pay visit to the historical Trongsa Dzong. Ura village is located 105 km east of Trongsa. It is a beautiful village with about 40 households clustered together, with cobbled walkways in between and at center is the Ura Lhakhang. The village serves as a perfect example of settlement pattern of Bhutan during the medieval period. After arriving here, we will go for a short hike around the village and called it a day. Today is the highlight of our tour. We will dedicate our day witnessing the festival, mingling with locals and knowing more about the culture and traditions of Bhutan. Towards late afternoon we will head back towards Bumthang for overnight. 1. Kurje Lhakhang: Located in Kurje in the Chokhor valley, around 15 minutes’ drive from Chamkhar town (Bumthang), the site of the three temples has a body impression of Guru Rinpoche left behind after he meditated there and subdued evil spirits the chief of which was Shelging Karpo. Kurje means body impression. Guru Rinpoche visit Bumthang in 746 AD at the invitation of the local king, Chakhar Gyalpo. The oldest temple was built in 1652 by Chogyal Migyur Tenpa, the first Choetse Chila. The second temple was built in 1900 by the first King Gongsa Ugyen Wangchuck on the spot where Guru left his body imprint, and the third temple was built in the 1990s under the commanded of Queen Mother Ashi Kesang Choeden Wangchuck. The first, second, and the third temple contain respectively the three Buddhas (the past, present, future), a 12-metre tall statue of Guru Rinpoche, and Khenlop Chosum (Guru Rinpoche, King Thrisong Duetsen, and Pandit Santarakshita). 2. Jakar Dzong: Located on a ridge above Chamkhar valley, Jakar Dzong, formally called Jakar Yugyal Dzong, was founded by Lam Ngagi Wangchuk (Buddhist priest) in 1549. Lam Ngagi Wangchuk was believed to have seen a white bird land at the spot where he built a small temple and started a monastic body. Later, when Desi Chogyal Migyur Tenpa (secular head of Bhutan, 1667-1680) expanded the temple into a Dzong in 1646, it came to be known as Jakar (Bya dkar) Dzong (White Bird Dzong). The Dzong houses many temples and it is today the seat of district administration and monastic body. 3. Tamzhing Monastery: Located in Tamzhing, some 20 minutes’ drive from Chamkhar town, it was built in 1505 by Terton Pema Lingpa; the temple served as his main seat. The relics contained in the statues in the temple are treasures discovered by the terton (treasure discoverer) himself. The two-storey temple houses the images of Peling Tsokhor Sum (three principal deities of Peling tradition), the three Buddhas (Duesum Sangay), Guru Tshengyed (eight manifestations of Guru Rinpoche), and a life-size statue of Terton Pema Lingpa. Among many relics crafted by the founder himself are the hat of Guru Statue and metal chain armour. After having wonderful time at Bumthang, it’s time to head back but to a very beautiful glacial valley called Gangtey. 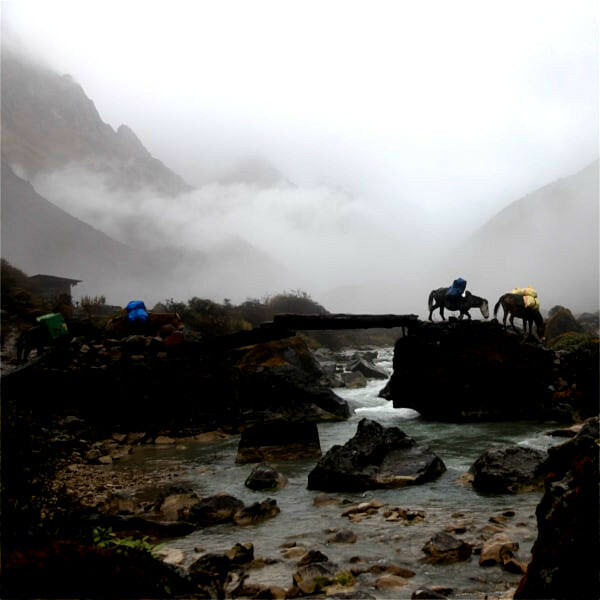 Considered amongst the most beautiful valley in Bhutan, Gangtey is a most desired destination for every visitor to Bhutan. It is home to one of the rarest crane species, the black necked crane, which migrates during winter month (November, December, and January) from neighboring Tibetan plateaus and northern India. We will spend one more day here at this beautiful valley, exploring around, going for a short hikes around, meeting with local farmers and pay visit to Gangtey Monastery. Today we will head back towards Paro. If time permits we will visit to Paro Rinpung Dzong and National museum. 2. Paro Ta Dzong: Located on a spur above Rinpung Dzong, five and a half kilometres’ drive from Tshongdu town, the dzong was built in the mid-17th century as a watchtower overlooking Rinpung Dzong by Lanyongpa Tenzin Drukdra and Chogyal Migyur Tenpa. The circular dzong houses the National Museum of Bhutan. Yet another exciting day of tour is a hike to Bhutan’s most iconic monastery, the tigers nest monastery. Taktsang Monastery: Located 900 m above Paro valley on the face of a rocky cliff, about two and a half hours’ trek from the road point (6 hour round trip), Taktsang is perhaps the most famous monastery in the country. The monastery was named Taktsang after Guru Rinpoche flew there from Kurtoe Singay Dzong (Eastern Bhutan) riding on a tigress to subdue a demon. Gyalse Tenzin Rabgay, the secular head of the country (1680-1694) has begun the construction of the monastery at this site in 1692 and completed it in 1694. The monastery houses many temples that contain sacred statues of eight manifestations of Guru Rinpoche, Tshepame Yabyum and Bone relic of Pelgi Singay. After coming back from Taktsang, we will pay visit to Drugyal Dzong. Drugyal Dzong: Located in Phongdey village in Paro, the Dzong was built as one of the principal Dra Dzong (defense dzongs). While some attribute the building of the Dzong to Zhabdrung Ngawang Namgyal in 1649 to commemorate a victory over Tibetan invasion, some attribute it to the second Druk Desi Tenzin Drukdra. But as its name suggests (Druk – Drukpa; gyal – victory), the Dzong was built to celebrate the victory over Tibetans. The Dzong was used as the summer residence of Rinpung Rabdey until 1951 when it was completely burnt down. The Dzong is currently being rebuilt to its former glory to celebrate the birth of crown prince Jigme Namgyel. Your exciting tour of Bhutan comes to an end today. After breakfast your guide and driver will see you off at Paro international airport.